Priscilla Queen, a Negress, v. Francis Neale. The declarations of an ancestor, while held as a slave, cannot be given in evidence. Declarations of deceased persons, that the ancestor was free, may be given in evidence, to show that the ancestor was in fact free, that is, not held in slavery. Petition for freedom. The declaration of the ancestor, while held as a slave, cannot be given in evidence, to prove that the ancestor came from England. Per Curiam, (Thruston, J., absent.) A witness, in his deposition, stated that he heard a deceased person say that the ancestor was free. Mr. Law, for the defendant, contended that it was not evidence, because it was a mere opinion as to the question of right. But the Court (Thruston, J., absent,) permitted it to be read to the jury, as evidence that she was in fact free, that is, that she was not actually holden in slavery. 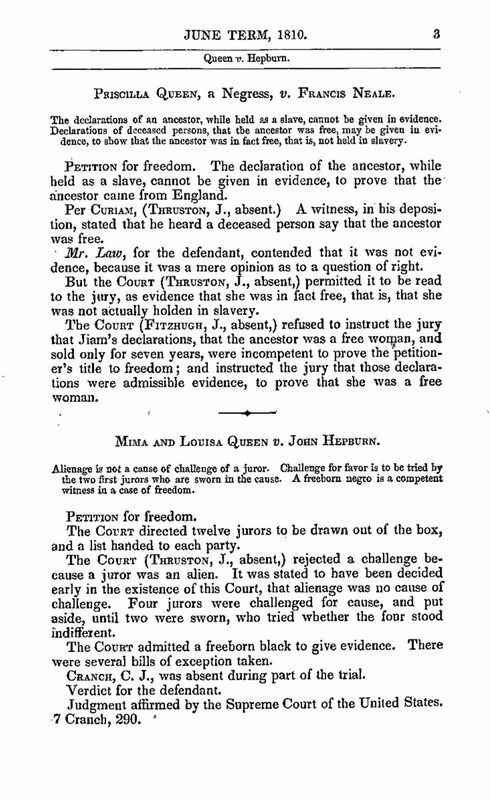 The Court (Fitzhugh, J., absent,) refused to instruct the jury that Jiam's declarations, that the ancestor was a free woman, and sold only for seven years, were incompetent to prove the petitioner's title to freedom; and instructed the jury that those declarations were admissible evidence, to prove that she was a free woman.